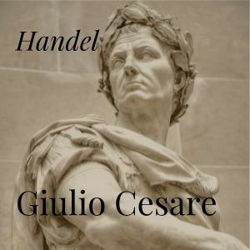 Handel’s Giulio Cesare tells the story of how Julius Caesar (Cesare) tries to bring peace to the turbulent relationship between the Egyptian and Roman empires, but is prevented from doing so by Ptolemy (Tolomeo), the current Egyptian King. Rather than making peace with their enemy, Pompey (Pompeo), Tolomeo orders him executed. Pompeo’s son and wife, Sesto and Cornelia, swear vengeance against him, and Cesare knows that a wicked pleasure-seeking king will only bring ruin on an empire. By rights, Tolomeo should not be on the throne; his sister, Cleopatra, is the rightful heir. She intends to use everything within her power to reclaim the throne, and wants to enlist Cesare in her fight. With so many people opposed to Tolomeo, and him distracted by his harem, it would seem an easy fight, but they have underestimated the loyalty of Achilla, the leaders of Tolomeo’s armies, and all does not go to plan. With themes of vengeance, love, betrayal, jealousy, and honor, Giulio Cesare has become a timeless classic in the opera repertory, and is one of Handel’s most well-known, and most often performed operas.